Nothing puts a damper on backyard barbecues faster than discovering there's a horde of wasps camping out for free rent nearby. All wasps are not equal, though, and some of these carnivorous insects are far more aggressive and venomous than their peers. Knowing who's who can help you decide how urgently their nest should be removed. Be warned that some wasps are notoriously vicious and removing their nest can put you in harm's way. The best time to remove their nest is early morning, such as the crack of dawn, but it's well-advised to call in a pro for this task. Hornets are among the most aggressive, vicious and venomous of the wasp family, surpassed only by yellow jackets. They can be two inches in size, and either white and black or yellow and black. They look similar to a yellow jacket but are larger. Hornets do not lose their stinger and sometimes sting a victim several times in one go. When you see hornets amassing near your home and there's a nest, it's usually a basketball or football shape, often in tree branches, attics, on buildings and even in hallows. There are as many as 700 in a nest, hence having their nests removed by a pro is wise. Their colonies are typically found in Northeastern United States and up into Canada. This social wasp is only a half-inch long, black and yellow, and is often mistaken for a honey bee. Unfortunately, unlike the honey bee, it doesn't lose its stinger and can sting victims multiple times with a painful attack. They're considered the most aggressive and vicious of all wasps. They're highly territorial and will defend their home, which is often a softball-shaped ground hole or nest in walls and attics. They love meat, which makes them attracted to everything from your grilling burgers to the wafting scent of bacon on the stovetop. That's why they often descend on barbecues or fly into kitchens on a Sunday morning as bacon's sizzling in a pan. This nasty-sounding wasp isn't much of a threat to humans, but they'll attack cicadas with their paralytic venom to drag the cicada body into the wasps' ground-based dwellings to feed their young. These wasps multiply extremely quickly, especially if the earth is sandy and excavated for their underground nests easily. Their two-inch black-and-pale yellow bodies are fearsome, but they likely won't start stinging you unless you provoke them or try to invade their home. There are five species of cicada killers with varying territories, but ultimately there's at least one kind of cicada in nearly every region of North America. Primarily black with yellow markings, these social wasps are often spotted dangling under roof eaves and tend to enjoy the somewhat sheltered and darker environs of trees, attics and other structured, shaded spots. They get their name from the grayish paper-like honeycomb-style hives they build for nesting, which house relatively few wasps, usually just 20 to 30 adults. 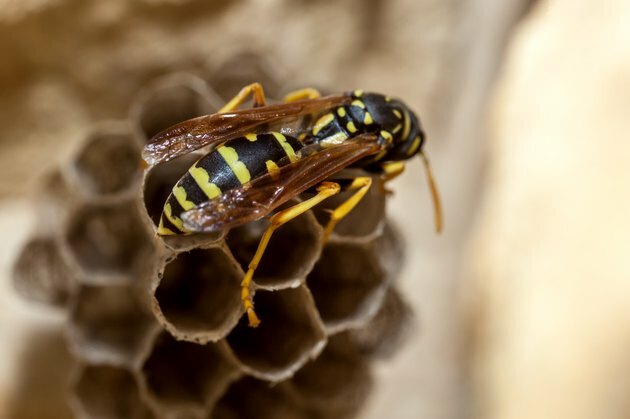 While their stings can provoke a strong reaction and are painful, these wasps will generally only sting when provoked or protecting territory. Paper wasps are usually about ¾- to 1-inch long and are most commonly found in the Pacific Northwest. Thought to look somewhat like an alien, these inch-long wasps have a strange stick-like waist and come with antennae. They're a solitary insect, though they live in nests that may house up to 20 wasps. These dwellings are generally a tube-like nest built of mud but usually affixed under eaves, in attics, ceilings, sheds and garages. They may sting, but it's not as common as with the more aggressive wasps. Interestingly, mud daubers are great for pest control because they like to feast on spiders and other insects, but are considered the mortal enemy of the dreaded black widow spider. Although they're often black and yellow, mud daubers can also be metallic blue and black with the blue variety being called the Blue Mud Wasp. The mud dauber is found throughout North America, even in Hawaii and Bermuda, with the biggest concentrations in Michigan, but they can also be found abroad in places like India.